Could a simple genetic test tell us which women will develop the chronic swelling condition known as lymphedema after breast cancer treatment? The value of such a test would be enormous, offering earlier detection and better management. No genetic test for lymphedema currently exists, but could we DIY (‘do-it-yourself’) one? Easy and inexpensive direct-to-consumer genetic testing services are now available, and new research into the genetics of lymphedema has uncovered exciting potential diagnostic markers. Is it possible to fast forward into the future, bypass the medical establishment, and test ourselves for a predisposition to developing lymphedema after breast cancer treatment? I decided to find out. 1 Is this idea as crazy as it sounds? Is this idea as crazy as it sounds? Isn’t lymphedema simply caused by damage to the lymphatic ‘plumbing’ system that helps maintain the balance of fluids in your body? Yes and no. Recent studies have found intriguing genetic differences between those who go on to develop lymphedema after breast cancer and those who do not. These differences, which I’ll call ‘genetic markers’, appear to predispose women to developing lymphedema after cancer treatment – and these markers could be tested for. If the science pans out, these genetic markers of lymphedema risk might one day be developed into diagnostic tests that usher in a new era of lymphedema prevention and management. Imagine if we could identify which women are strongly predisposed to developing lymphedema after breast cancer? This would enable earlier detection and thus better management of lymphedema in this unlucky group, and reduced anxiety and life disruption for the rest. It might even prompt more conservative breast cancer treatment regimens for some women who are at high-risk of lymphedema, which could possibly prevent lymphedema altogether. To realize this future we will not only need to identify and validate good genetic markers of lymphedema, we will also need businesses that are willing and able to commercialize them. Let me skip ahead to the punchline of this article: if you are a serious ‘do-it-yourself’ type of person (or ‘DIYer’) and are comfortable with wading into the uncertain waters of clinically unproven genetic testing, you could right now bypass the medical and regulatory establishment and determine for yourself if you have what *appears* to be a genetic predisposition to developing lymphedema following breast cancer treatment. In other words, you could perform your own genetic test for lymphedema risk. Exciting! Not surprisingly, this conclusion comes with some significant caveats – which I’ll explain below. Genetic markers of secondary lymphedema found in the scientific literature have not yet been clinically validated. There are countless examples of very promising looking diagnostic markers of disease that fail to show adequate value once evaluated in much more rigorous clinical trials. Direct-to-consumer genotyping services may not reliably ‘read’ our genetic markers of interest because these services haven’t been validated to meet the rigorous standards of commercial medical tests for these particular markers. So we can’t be sure how reliable our test results our. Without the support of a genetic counselor you might become careless about your health because of a so-called ‘good’ result, or unnecessarily distraught about a ‘bad’ one. The ability for you to bypass the medical establishment and access your personal treasure trove of genetic information without oversight has already arrived, and more and more people are jumping on this bandwagon every day. Resisting this change is foolhardy and stigmatizing the early adopters rather than supporting them with easy access to genetic counselors is counterproductive. Many of the diagnostic treasures that lie within your DNA will never overcome existing barriers to commercialization (time and cost, business model, and intellectual property), and so they will never be properly clinically validated nor turned into medical tests. Should a wealth of personal health information about you remain off-limits to you until businesses learn how to commercialize this information (if ever)? Or should some of us take a fly-by-the-seat-of-our-pants approach and dive in to help push things forward (taking everything we learn with a big grain of salt)? I’m not proposing unregulated genetic testing services, I’m advocating for DIYers. Would I encourage everyone to fix their own gas furnace or rewire the electrical panel in their house? Of course not! But I have done these things myself, and what I’ve learned in the process has helped me improve how my home functions. Every major innovation of daily life (including genetic testing) owes a direct debt to tinkerers and DIYers with disregard for conventional practice. Are there plausible genetic markers that a DIYer might use to *potentially* predict their personal risk of developing secondary lymphedema? Why do some patients treated for breast cancer go on to develop the chronic swelling condition known as lymphedema, while others do not? Not surprisingly, the biggest risk factor for developing lymphedema is the extent of damage done to the lymphatic system (especially the number of lymph nodes removed). Patients who undergo lymph node conserving SNB (sentinel node biopsy) have perhaps a 3-15% chance of developing lymphedema of the arm, whereas those who undergo a full ALND (axillary lymph node dissection) may have a 10 – 34% (or higher) chance (ref 1-4). But this still leaves many women with significant lymphatic damage never developing lymphedema, while others with only relatively mild lymphatic damage develop it quickly. So we know that additional factors do play a role. These additional factors appear to include: body weight, chemotherapy and radiation -induced damage, physical fitness, age, post-operative complications, and unrelated post-treatment events such as an arm injury. What about genetic predisposition? Lymphedema can be inherited after all (called ‘primary lymphedema’), which is a result of mutations in genes involved in lymphatic system development. Could a subtler genetic predisposition to lymphedema be prevalent in the population and manifest only after breast cancer treatment challenges the lymphatic system? It appears so. A growing number of studies suggest that unrecognized genetic variation between patients is playing a much bigger role in predicting patient susceptibility to lymphedema than was originally suspected (here’s a good start to learn more: refs 5-8). I found a recent study that offers a couple of particularly exciting genetic markers for us to try out in our DIY test: two ‘single nucleotide polymorphisms’ (SNPs) named rs3543 and rs705193 (ref 9). DNA is your body’s instruction manual. It’s like a book that is roughly 3 billion characters in length but written using only four molecular ‘letters’ (the nucleotides A, T, C and G). A SNP is simply a change in one of those letters that was passed to you by one or both of your parents, and which in turn you could pass on to your offspring. Sometimes these SNPs occur in a gene that tells your body how to make a certain protein (all functions in your body are in one way or another controlled by proteins). A SNP might therefore be associated with a particular disease or phenotype (such as having blue eyes) because it directly alters the structure (and thus function) of a protein in some meaningful way. Or perhaps a SNP has no direct impact at all on a gene and is instead simply associated with a disease or phenotype because that SNP tends to be inherited alongside another genetic difference that is of consequence. For the vast majority of SNPs we have no idea what direct effect(s) they have, if any, or how these effects might depend on the presence or absence of other genetic differences or environmental context. Hence, we often call SNPs “genetic markers” of a particular disease or phenotype if its presence correlates with having that disease or phenotype (and we seldom refer to SNPs ‘causing’ a disease or phenotype). The SNPs rs3543 and rs705193 represent different versions of the gene known as GJA4 (or more precisely, different versions of a single nucleotide in this gene). This gene is used by your body to make the protein Cx37, which helps control how tightly cells in your body stick together, including cells of the lymphatic system. So functionally speaking, it’s an interesting gene that one could imagine might predispose a person to lymphedema if it were altered. But for our purposes I won’t elaborate further since it doesn’t matter if the SNP itself causes lymphedema, correlation alone suffices for diagnostic purposes. Indeed, the authors of the study concluded that these two SNPs were “associated with an increased risk of secondary lymphedema in patients undergoing breast cancer treatment”. Perhaps more precisely, their analysis suggested that if a woman in their study had the genotype ‘CC’ at rs3543 or rs705193 they were statistically less likely to have lymphedema following breast cancer surgery. For example, in their study of 102 women (51 with lymphedema and 51 without) only 24% of women with ‘CC’ at rs705193 had lymphedema, while 62% of women with ‘CG’ did. Likewise, only 18.5% of women with ‘CC’ at rs3543 had lymphedema, while 58.2% of women with ‘CT’ did, and 68.2% of women with ‘TT’ did. Therefore ‘CC’ appeared to be a desirable genotype with respect to secondary lymphedema, and their statistical analysis ‘confirmed’ this. Obviously, additional larger studies are required to verify these observations, to validate the utility of the SNPs diagnostically, and to give us a clearer idea of how we might use this test to change patient care. Hopefully larger studies will follow, but for now we can say that these two SNPs *appear* to be good candidates for helping us predict risk of lymphedema secondary to breast cancer. From a DIY perspective they are also good candidates because they are SNPs. SNPs are a type of genetic marker that’s easy and cheap to test for because it only requires looking for a single letter (nucleotide) change at a specific location in the DNA, and SNP genotyping technology is consequently very popular, relatively inexpensive, and readily available in a direct-to-consumer format. Of course, with further digging a more comprehensive list of putative genetic markers of secondary lymphedema could be created. The most comprehensive of which would entail sequencing (reading) the full genetic code of all the genes suspected to play a role in the development of secondary lymphedema. Sequencing entire genes would enable us to not only look for SNPs, but to also identify additional deviations from ‘normal’ including nucleotide insertions, deletions, duplications or rearrangements. But for an easy DIY proof-of-principle, let’s just start with our two SNPs. In summary, the answer to our first question is yes: there exists putative (i.e. unproven) genetic markers of secondary lymphedema that a DIYer could use to *potentially* predict their personal risk of developing the condition after breast cancer treatment. Thinking about the above got me excited. With my two SNPs in hand, could I simply buy a direct-to-consumer genetic testing kit from Amazon such as 23andMe or AncestryDNA (two of the most popular services, which test for at least 640,000 and 710,000 SNPs, respectively), spit in a tube, mail it away, and then read the results myself? Both companies will allow you to download your raw data in a text file, so I could simply search my results file for the SNPs rs3543 and rs705193 and check to see if it shows the (apparently) more desirable ‘CC’ genotype or something else. Et voila! a DIY genetic test for lymphedema risk post breast cancer treatment (keeping in mind the grain – or bag – of salt that should be taken with it). 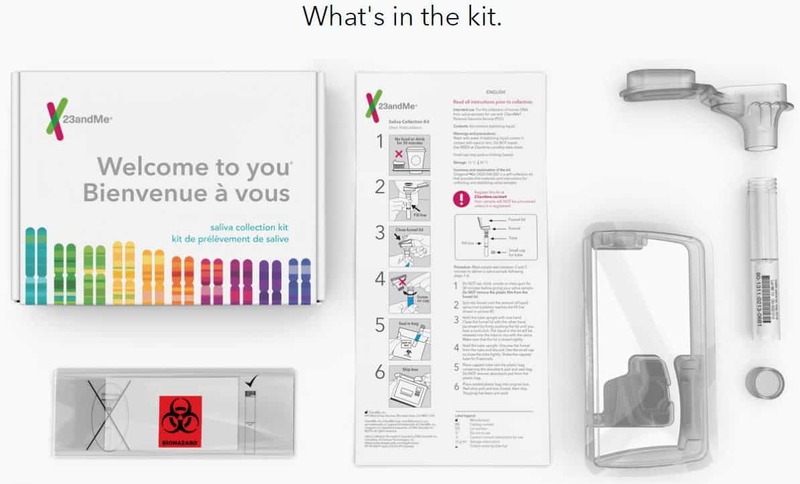 Contents of the 23andMe direct-to-consumer genetic testing kit that evaluates approximately 640,000 SNPs. Picture courtesy of their website. But before going ahead I wanted to be sure that my $129 Canadian dollars ($99 USD) was going to be well spent. Do either or both direct-to-consumer tests include the SNPs that I’m interested in? While both companies will read an enormous number of SNPs in your DNA, they are by no means exhaustive; there are over 4 million SNPs classified so far. In fact, less than half of the 110,000 ‘high-interest’ SNPs found in SNPedia (an online library of SNPs that have solid research behind them) are included in the 23andMe and AncestryDNA services. Furthermore, the overlap in SNPs investigated by these two service providers is also small. These two companies don’t publish their list of SNPs, so I had to do a little digging to find out if my two lymphedema-related SNPs of interest can be investigated using their services. I found this information on the website of the technology company that underlies these (and all similar) direct-to-consumer SNP genotyping service providers: Illumina. Unfortunately, while many of the 21 SNPs hypothesized to play a role in primary lymphedema are included in one or both of 23andMe and AncestryDNA, our two SNPs of interest for secondary lymphedema appear to be absent from any direct-to-consumer SNP genotyping service provider. Hopefully future iterations of these tests will include our SNPs of interest, especially since they now have clinical data associated with them. Have I hit a dead end? Yes and no. Current direct-to-consumer SNP genotyping services can’t help me investigate whether or not I have these particular SNPs, but direct-to-consumer full genome sequencing services such as those offered by Veritas certainly could. Sequencing your entire genome would give you your complete genetic picture (almost), including your SNP results for rs3543 and rs705193. Therefore, using direct-to-consumer full genome sequencing services we could DIY our genetic test for lymphedema risk post breast cancer treatment. Unfortunately this new approach has downsides. Full genome datasets are more difficult to interpret than SNP genotype results, especially for a DIYer, and may have reduced reliability for evaluating individual SNPs. Critically, they also cost at least $999 USD. There are also other considerations when contemplating full genome sequencing: are you prepared to have your full genetic blueprint in hand? What else might you do with it? What might you want (or not want) to learn about yourself? Whereas I was willing to spend a bit of money to test out a relatively cheap, easy, and accessible DIY genetic test for lymphedema risk using SNP genotyping (and in the process potentially learn some other neat stuff about my genetic ancestry), I’m not willing to have my full genome sequenced… just yet. If you are considering signing up for a direct-to-consumer test, be sure to first read my post on protecting your genetic privacy with anonymous 23andMe testing. Ronka R, von Smitten K, Tasmuth T, Leidenius, M. One-year morbidity after sentinel node biopsy and breast surgery. Breast. 2005 Feb; 14(1):28–36.